I’m not really a fan of the Saw series. I quite enjoyed the original movie back when it was released in 2004 and have watched it a few times, but then Saw II happened. 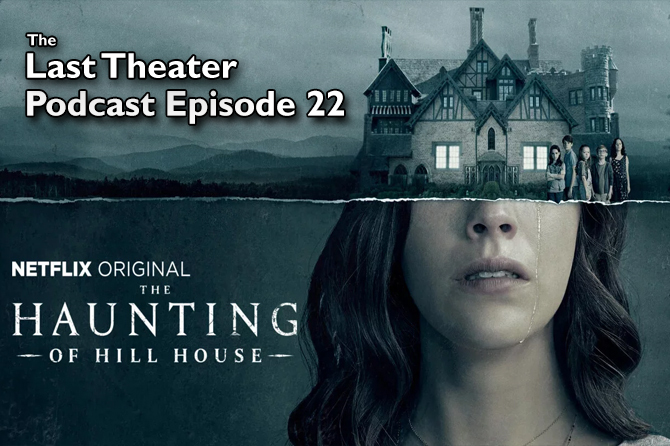 While the first movie had the advantage of using a bit of mystery to prop up its simple story and neat little twist at the end, the second installment was stripped of any satisfying mystery and relied on gory set pieces and a convoluted plot structure. While I’ve seen Saw a few times over the years and can find a number of things I enjoy, there was only one thing about Saw II that I thought was clever (which I won’t divulge here because it would spoil the final scenes). Then the movies kept coming out year after year. My interest waned, and even though I’ve seen some of the sequels, I lost track at some point and haven’t seen all seven entries. So why am I starting a review of Jigsaw, the relaunch of the franchise started by Saw, by saying I don’t have much of a particular interest in the movies that came before it? Because I think a little background is necessary before diving into Jigsaw. It is a movie that is built upon a lot of lore, and it has a lot of fans. At the same time though, the title isn’t Saw, it’s Jigsaw. I think the filmmakers wanted this to be a jumping-on point for new viewers, otherwise they wouldn’t have changed the name. Because of that, I think that Jigsaw should be able to stand on its own with no prior knowledge of the series. With my limited memory of the later episodes in the series, I think I was able to watch the movie without the burden of too many expectations. And after seeing it, I think going into Jigsaw with low expectations is the best way to go. Going into Jigsaw blind is the best way to go. As a standalone picture and a probable starting point for a new set of sequels, Jigsaw works as well as expected. Which is to say, it’s fine, but fans of modern horror, or even of thrillers and mysteries, won’t find anything new or unexpected here. The plot structure is fairly standard, with two plot lines running parallel until they begin to bleed into each other later in the film. A large part of the enjoyment of Jigsaw is based on a whodunnit structure, so revealing how the simultaneous plots connect would spoil the movie, but I’ll try to touch on each side of the story individually. 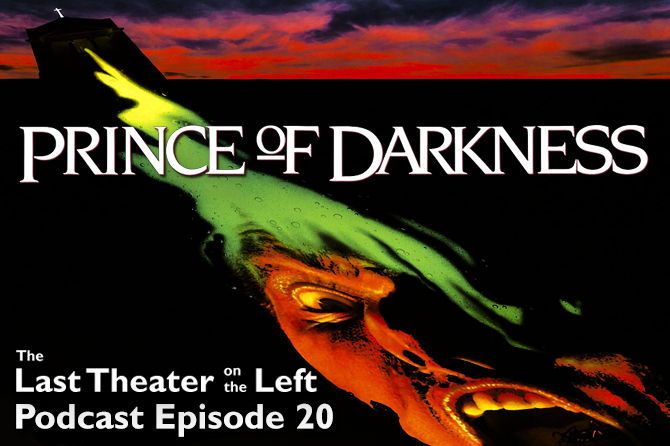 One plot line focuses on five people trapped together in a series of rooms, forced to endure a series of complex and deadly traps. Hope of escape is dangled in front of them to keep them moving forward, but escape is only possible if they follow all the rules and expose their darkest secrets. Of course, rules are not always followed and secrets are routinely withheld until the last possible moment, so people start dying. 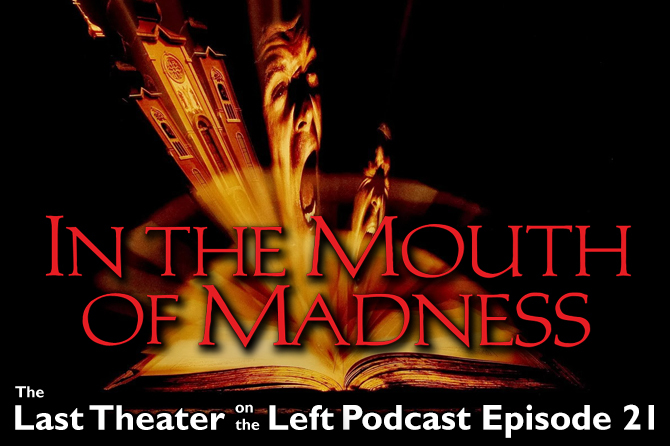 The blood and gore flows to a relatively high degree, though it’s hardly the most violent or bloody movie to make it to a wide theatrical release. Since the traps and kills are probably the main selling point for the Saw series, at least for general audiences, I’d say Jigsaw comes in with a fairly average score in that regard. There are some satisfyingly gory moments, but the traps themselves aren’t particularly clever. Also, a number of the traps and situations that the people get themselves in rely on a fair degree of chance. Someone has to step in the correct place at the correct time, or certain deadly implements have to miss a killing blow again and again for the games to continue. A lot of this can be forgiven and explained by the mastermind behind everything being a fantastic manipulator and supremely prepared with backup plans within backup plans, but as the movie goes on and things continue to happen apparently according exactly to plan, that forgiveness stretches a bit thin. Still, the complexity of the kill scenarios is part of the moderate fun of the movie, so it’s best not to think about it too hard. 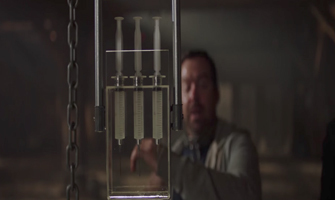 Many traps seem to riff on traps in earlier movies, like the needle trap in Saw II. One of my issues with a lot of modern horror movies is that the reliance on kills and blood means that less time is spent on developing characters that the audience can care about. Jigsaw is no exception. Of the five people trapped and tortured, we only sort of begin to feel a connection to one by the end of the movie. 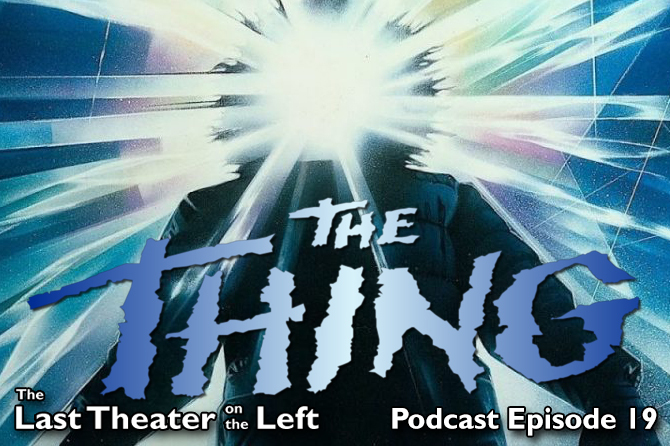 And by the end of the movie, none of the five really matter anyway, something the big reveal at the end exacerbates. Some of them have slight connections to what’s going on in the other side of the story, but it all just feels superficial. They’re really just props for the kill scenes. It makes sense though. If you see a trap in one of these movies, you’re virtually guaranteed to see the trap work, so some of the people have to die before they can be fleshed out. They’re all “bad” people people anyway, people you would expect to die in any and every horror movie. People we have been conditioned to cheer for their deaths in movies. Well, all of them except for one. One of the prisoners is literally and figuratively faceless. He, like all the rest, just don’t matter much. The people who do matter to the story are all on the other side of the simultaneous plots. This is the whodunnit side. It features the standard roles of two police detectives and a forensics team. 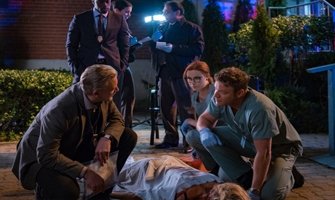 In between watching the five prisoners try to survive, we follow the progress of the group trying to piece together the clues and track down the person responsible for the dead and mutilated bodies that keep showing up. The clues point to the Jigsaw Killer, but we learn early on that he’s been dead for years. Could it really be him? As clues continue to stack up, it seems that someone within the team might also be involved. But who? Accusations are thrown in many directions, so no one knows whom to trust. The mystery aspect of Jigsaw is fairly interesting most of the time, but again, there are few things fans of mysteries haven’t seen before. Perceptive viewers might be able to pick up on hints along the way, some of which might turn out to be important. I was proud of myself for picking up on things that aren’t explicitly focused on throughout the movie but turn out to be huge clues when all is revealed. That part of the movie was fun for me and is probably the only reason I’d ever want to watch Jigsaw a second time, so I could look for some of the clues I missed. It’s one of those mysteries that seems like it isn’t too difficult to solve before the climax, which is fun, but then it makes itself overly complex in the end. The final portion of the movie is all about the big reveal, and it seems to take forever. Everything is explained in great detail and shown to us in flashbacks. There are clever parts to it, but telling an audience exactly what happened isn’t as much fun as letting them figure it out for themselves. It’s okay to leave some things ambiguous (even encouraged in my opinion), but Jigsaw holds our hand and walks us along the entire backstory and every connection leading up to the finale. It gets too complex to be compelling, and the twists within twists make some of the earlier actions not work as well as they would if they had been left alone. After watching this, I realize that the film’s production company, Twisted Pictures, isn’t a reference to the bloody violence in their movies. It’s a reference to the plots. The team on the case, most likely explaining something in great detail. That leads me back to Saw. The twists in Jigsaw might feel original if you’ve never seen a Saw movie before, but if you’ve even just seen the first few, the twists feel a lot like rehashes. Some of this is most likely by design, and it makes sense given how the movie ends, but it doesn’t make it feel any more fresh or original. Jigsaw feels very much like a Saw movie, to the point where if you like the franchise and want to see the same thing again, Jigsaw is a good way to go. I do think this movie rewards longtime viewers. Even I got a lot of the references to past films, but they weren’t so obvious that they distracted from the flow of the movie. The references weren’t thrown in haphazardly either. They all meant something, or they at least belonged in a way that made perfect sense. I think most Saw fans will enjoy Jigsaw. Yes, the title is different and this movie is a good starting point for new viewers, but you can’t spell Jigsaw without Saw. It belongs there, and it’s there in the title for a reason. If you don’t like any of the Saw movies, you won’t like Jigsaw. And, if you’ve never seen any of the Saw movies, but you enjoy twisty, bloody mysteries where things don’t always connect like they should and the characters are kept at a respectable distance from your emotions, then you might want to give Jigsaw a try. Just keep your expectations low. The traps aren’t clever enough, the deaths aren’t bloody enough, the characters aren’t intriguing enough, and the mystery is way to twisty for me to give this anything other than an average rating. It’s not bad, and I might watch it again once it hits home video, but I don’t necessarily think Jigsaw will win any new fans to the franchise. If you want a few nice scenes of gore though, you could do worse. Watching the traps/kills side of Jigsaw reminded me of Cube. Cube is a low-budget science fiction movie in which a small group of strangers find themselves trapped together in a series of interconnected rooms. Each room is a cube, and each new room brings with it the possibility of an excruciating death. 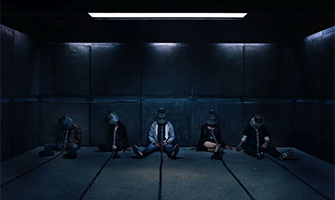 The strangers must work together to find out how they are all connected, why they were each picked to be placed inside the cube, and most importantly, how to escape. Cube is a good example of making an audience care about characters while still delivering some nasty deaths. It’s not nearly as bloody as Jigsaw, but it doesn’t need to be. Watch the trailer for Jigsaw.